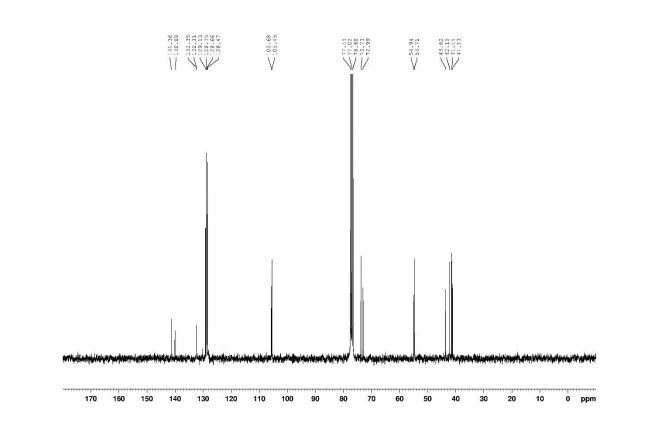 13C NMR (75 MHz, CDCl3) δ (ppm) 141.4, 140.0, 132.4, 132.3, 129.1, 128.7, 128.7, 128.5, 105.7, 105.4, 73.7, 73.0, 54.9, 54.7, 43.6, 42.1, 41.4, 41.1. (20) (a) Oliveira, C. C.; Angnes, R. A.; Correia, C. R. D. J. Org. Chem. 2013, 78, 4373. (b) Oliveira, C. C.; Pfaltz, A.; Correia, C. R. D. Angew. Chem. Int. Ed. 2015, 54, 14036. The optimization of a palladium-catalyzed Heck–Matsuda reaction using an optimization algorithm is presented. We modified and implemented the Nelder–Mead method in order to perform constrained optimizations in a multidimensional space. 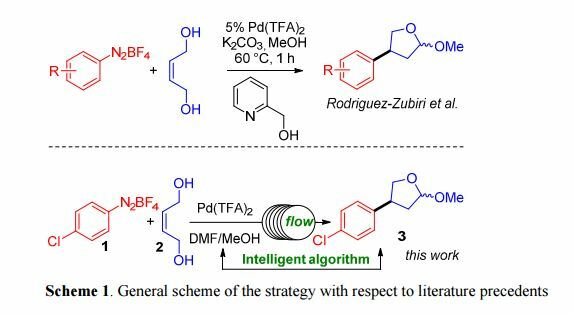 We illustrated the power of our modified algorithm through the optimization of a multivariable reaction involving the arylation of a deactivated olefin with an arenediazonium salt. The great flexibility of our optimization method allows to fine-tune experimental conditions according to three different objective functions: maximum yield, highest throughput, and lowest production cost. The beneficial properties of flow reactors associated with the power of intelligent algorithms for the fine-tuning of experimental parameters allowed the reaction to proceed in astonishingly simple conditions unable to promote the coupling through traditional batch chemistry. A low temperature reactor platform that facilitates metalation followed by electrophilic quenching, and related reactions under continuous flow-through conditions has been developed. Pre-cooling loops are incorporated for all 3 reactor input streams and gaseous reagent inputs can be easily introduced by attaching a ‘tube-in’tube’ presaturation module. At 225-300 [degree]C and 20-70 bar, glycerol acetals are upgraded by a continuous-flow catalyst-free transesterification of dialkyl and alkylene carbonates. At 250–300 °C and 30–50 bar, a continuous-flow (CF) transesterification of different dialkyl and alkylene carbonates (dimethyl-, diethyl-, dibenzyl-, and propylene carbonate, respectively) with two glycerol derived acetals (glycerol formal and solketal) was investigated without any catalyst. An unprecedented result was obtained; not only the desired process occurred, but also the formation of the corresponding mono-transesterification products took place with an excellent selectivity (up to 98%) in all cases. Under isothermal conditions, a study on the effect of pressure allowed us to optimize the conversion of acetals (up to 95%) for the reactions of dimethyl- and diethyl-carbonate (DMC and DEC, respectively). 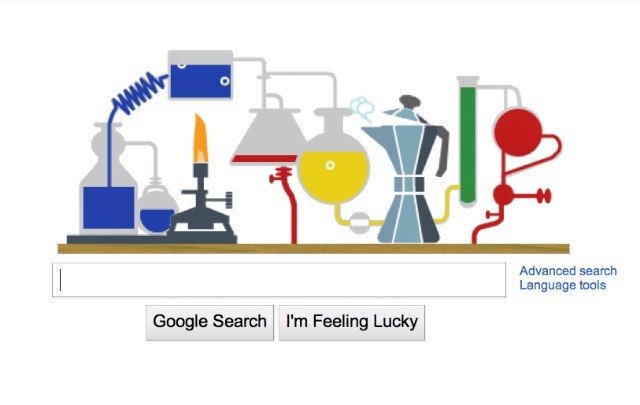 This proved that an abrupt progress of the reaction occurred for very small increments of pressure. For example, at 250 °C, the thermal transesterification of DMC with glycerol formal showed a sharp increase of the conversion from 1–2% at 30 bar to [similar]85% at 37 bar. The lower the temperature, the lower the pressure interval at which the onset of the reaction is achieved. The absence of catalysts allowed us to run CF-reactions virtually indefinitely and with a very high productivity (up to 68 mg min−1) compared to the capacity (1 mL) of the used CF-reactor. Products of the transesterification of DMC and DEC were isolated in good-to-almost quantitative yields. In the case of heavier carbonates, steric reasons were responsible for the considerably lower reactivity of propylene carbonate (PC) with respect to DMC and DEC, while the transesterification of dibenzyl carbonate (DBnC, solid at room temperature) with glycerol formal required the presence of acetone as an additional solvent/carrier. Although the reactions of both PC and DBnC were not optimized, results offered a proof-of-concept on the extension of thermal transesterification processes to higher homologues of linear and alkylene carbonates. D.L. Browne,* I.R. Baxendale, S.V. Ley, Tetrahedron 2011, 67, 10296-10303. A key intermediate for the synthesis of hydrazines via a mild, metal free reduction of diazonium salts has been isolated and characterized by X-ray analysis. The presence of this intermediate is general, as demonstrated by the preparation of a number of analogues. A discussion of the mechanism and potential benefits of such a process are also described. C. Battilocchio, J.M. Hawkins, S.V. Ley, Org. Lett. 2014, 16, 1060-1063. † Innovative Technology Centre, Department of Chemistry, University of Cambridge, Lensfield Road, CB2 1EW, Cambridge U.K.
A sustainable flow chemistry process for the hydration of nitriles, whereby an aqueous solution of the nitrile is passed through a column containing commercially available amorphous manganese dioxide, has been developed. The product is obtained simply by concentration of the output stream without any other workup steps. The protocol described is rapid, robust, reliable, and scalable, and it has been applied to a broad range of substrates, showing a high level of chemical tolerance. T. Brodmann, P. Koos, A. Metzger, P. Knochel, S.V. Ley, Org. Proc. Res. Dev. 2012, 16, 1102-1113. A newly developed microscale ReactIR flow cell was used as a convenient and versatile inline analytical tool for Grignard formation in continuous flow chemical processing. The LiCl-mediated halogen/Mg exchange reaction was used for the preparation of functionalized arylmagnesium compounds from aryl iodides or bromides. 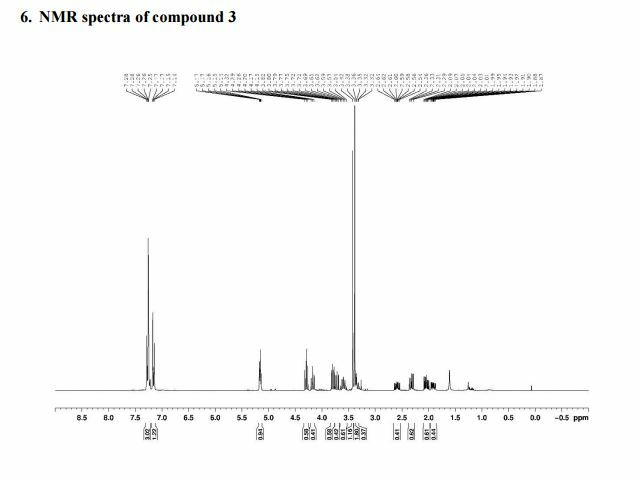 Furthermore, inline IR monitoring was used for the analysis of conversion and possible byproduct formation, as well as a potential tool for elucidation of mechanistic details. 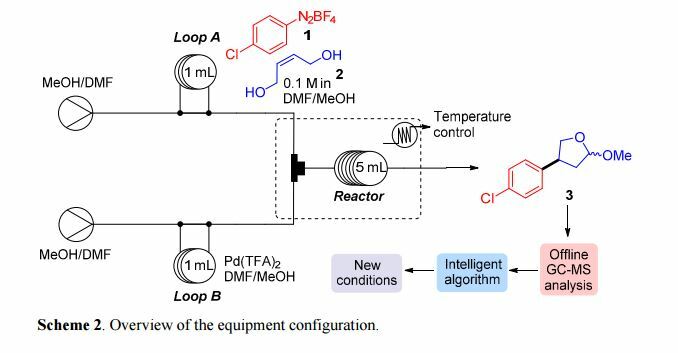 The results described herein indicate that the continuous flow systems are effective for highly exothermic reactions such as the Grignard exchange reaction due to fast mixing and efficient heat transfer. Wolff-Kishner reductions are performed continuously in a silicon carbide microreactor. Short reactions times and safe operation are achieved, giving high yields without reactor corrosion issues using just 1.5 equivalents of hydrazine. BEST BLOG ON ORGANIC CHEMISTRY, Readership worldwide, combines highend items with basics, email or call now for sure success formula, amcrasto@gmail.com, 9323115463. you can swim to the shore even if you are drowned in a storm.